The free redundancy entitlements calculator aim to help you work out your redundancy payments. How much redundancy pay lump sum you can get? Redundancy might not be a good thing but at least you should be able to get the redundancy entitlements that you are entitled. You can use this free redundancy calculator to estimate how much redundancy payments you should be able to get. This free redundancy payments calculator also estimates the tax free and taxable amounts of your redundancy payout. It will work out the tax on your redundancy entitlements and show how much net after tax redundancy pay you can get. (4) redundancy pay entitlements (if applicable). 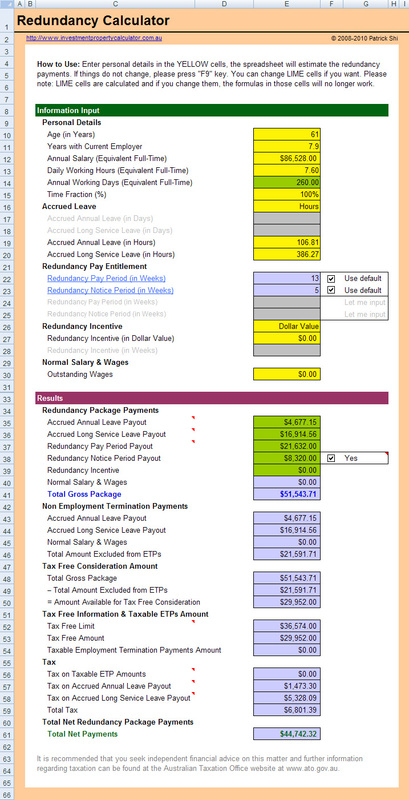 Here is a screen shot that will give you a better idea that what you need to do and what the free redundancy entitlements calculator can do for you. Download FREE Redundancy Calculator Now! If your company has your own redundancy polices and would like to customize the free Redundancy Calculator, please contact me. You can have a look at this sample of customized Redundancy Calculator. Free update is included in the Commercial Use price.